An earwig’s body is divided into three parts ― head, thorax, and abdomen. The earwig isn’t capable of staying airborne for a long period and compensates for it by running fast on the ground. They nest in dark, moist places, especially under stones, mulch, leaves, logs, flowerpots and rotting wood. They are predominantly social and gather in large groups to cause noticeable damage to vegetation. An earwig’s body is divided into three parts ― head, thorax, and abdomen. Two small eyes, a mouthpart for chewing and two long antennae are positioned on the head. Two pairs of wings and three pairs of legs are attached to the thorax. The short leathery forewings cover the large and circular hind wings. The earwig isn’t capable of staying airborne for a long period and compensates for it by running fast on the ground. The pincers (forceps) located at the rear end of the abdomen are the most prominent feature of this insect. They are large and look terrifying. They are used for seizing prey and defending against predators. Earwigs have a flattened body, which enables them to squeeze into tiny spaces. Their body length varies from 6mm to 18mm. The Australian earwig is relatively large species that can grow up to 50mm in length. This species is commonly found in the southern parts of the U.S., especially in Florida. It has a dark back and a yellowish underbelly. It lacks the short, leathery wings found in most other species. However, it does have pincers to capture prey and is very much capable of infiltrating homes in large numbers. Unlike the red-legged earwig, the striped earwig is not fond of attacking homes and outdoor vegetation. 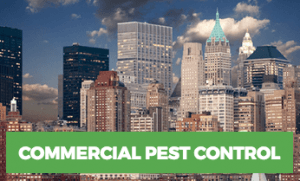 However, in dry and unfavorable conditions, it has no choice but to find refuge in the dark and moist locations inside a house or a building. 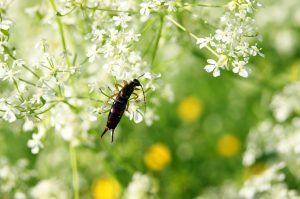 Earwigs are predominantly social and gather in large groups to cause noticeable damage to vegetation. It is highly unlikely for earwigs to access your homes, as they are primarily outdoor insects. However, they are often carried accidentally inside homes by way of flowerpots and fruits. The female earwig does a great job at taking care of its kids, unlike mothers of other insects. She makes sure that the eggs stay in sight and inside the burrow. She constantly cleans them so that parasites and fungi don’t cause them any harm. She also provides food to them until they are capable of fending for themselves. However, there’s a dark side to Mama Earwig too. If one of her offspring does not leave the nest when she wants it to, she eats it for showing disobedience. Earwigs nest in dark, moist places, especially under stones, mulch, leaves, logs, flowerpots and rotting wood. They are nocturnal animals and mostly seen foraging during the night, under bright lights. They only reproduce in moist soil. 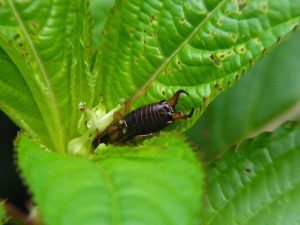 Like most insects, earwigs undergo three stages in their life cycle ― egg, nymph, and adult. The mating season is fall. During this time, the male and female spend time together in a nest covered with debris, soil or a crevice. 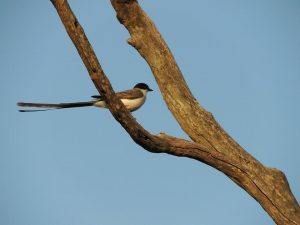 In early spring, when the male leaves, the female lays around 50 to 80 eggs. In about seven days’ time, the nymph hatches from the egg and nourish itself on the same egg-casing from which it hatched out from. Nymphs lack wings and are tiny and yellowish. In a process known as molting, they discard their outer skin at least 5 times to grow in size. After each molt, the size of their antennae and wings increases. The nymphs sexually mature in 45 days and appear more or less like adults around that time. -Bitten-off vegetation especially leaves in your garden. -Ripe fruits and vegetables in your kitchen that have distinct holes and black discoloration. -Flowers in vases that show signs of an earwig bite. -Funky odor inside the house. Earwigs don’t pose any serious threat to humans. They don’t painfully bite or sting and aren’t poisonous. 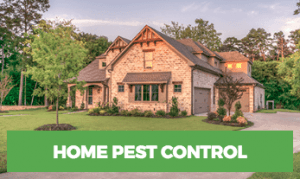 However, homeowners should get rid of them at the earliest because they cause massive damage to roses, oranges and other plants. In rare cases, they can also enter into a human’s ear and pinch it with its anterior pincers. Since birds don’t mind the odor of earwigs, which makes them excellent control predators. Toads also love the taste of earwigs. So, what you can do is attract birds by positioning bird feeders close to dark and moist places especially around flower vases, and other wet vegetation. Toads can be attracted by planting shrubs that allow them to hide and provide a lot of insects to feed on. The earwig hatches its eggs in late winter. Luckily, this is also the time when birds find it hard to get their hands on an adequate supply of food. Placing bird feeders in this time is an excellent tactic to lure these desperate birds towards an earwig’s nest. Trapping is an effective way to manage an earwig problem. Place several traps alongside shrubbery, fences, and vegetation. Make sure they are hidden. A can containing tuna fish or pet food and 100 ml of oil is an excellent trap to bait earwigs. You can also line the can with bacon grease. The best way to place these traps is to sink them in the ground in a way that only the topside of the can is above ground. Dispose of captured earwigs and recycle traps. You can drain them into soapy water or crush them in sturdy plastic bags. Keep on repeating these trapping practices until there are no signs of earwigs. If there are frequent sightings of earwigs inside your home, inspect it thoroughly and seal cracks and entry points with inorganic caulk. Remove harborage outside the building, especially the ground cover, tall mulches, leaf litter, wood piles, and other organic matter that earwigs are prone to survive on.